The Defense Department’s tape test uses a ratio of the circumferences of your neck and waist to figure out your body fat percentage. While your waist should be slim and toned, your neck should be thick and strong. If you have a skinny neck and a pear shape, excess body fat can put you at risk of failing the test. You can do various exercises, ranging from shrugs for your traps to neck raises with weights to build your neckline. If you can’t get to the gym, perform isometrics or neck contractions requiring no equipment and that can be performed at home. Perform a shrug with a barbell to build your trapezius muscle and build your neckline. Begin by standing feet shoulder-width apart and knees slightly bent. Hold the barbell with arms extended in front of your thighs, using an overhand grip. Contract your glutes and abdominals throughout the exercise. Exhale and pull your shoulders up to your ears, keeping your head and spine tall. 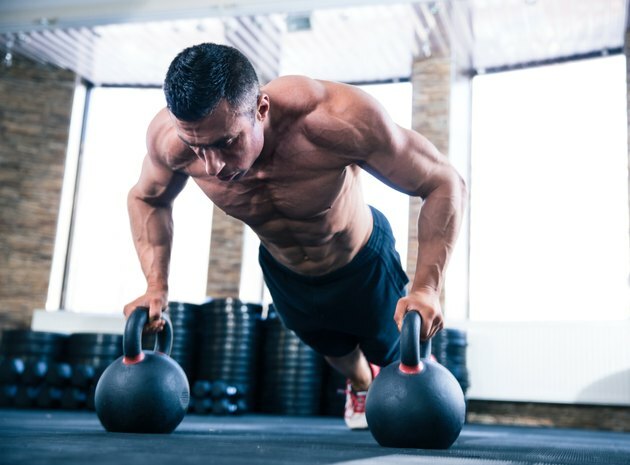 Squeeze your traps at the top of the movement. Avoid rolling your shoulders. Return the weight to the starting position and then relax and inhale. Perform 12 reps for three sets, using 45 to 55 percent of your one-rep maximum to build a foundation a strength. Rest for two to three minutes between sets. Increase the load by 10 to 15 percent as you gradually gain strength until you reach 70 to 80 percent of your one-rep maximum. Reduce the number of reps to 10 at the higher loads. Put the harness on your head. Stand with your feet shoulder-width apart and your knees slightly bent. Lean forward a little from the hips so the weight hangs in front of you. Place your hands on your thighs to help you stabilize your body. Raise your head slowly up and back in a smooth arcing motion. Perform 15 to 20 reps for three sets, using a 1- to 2-pound weight plate to establish a base of strength. Repeat the exercise, moving your head from right to left. Increase the load gradually to 5 pounds and then 10 pounds as your neck grows stronger. Perform a neck pull with elastic resistance to build the muscles in the front of your neck. Start by tying the ends of rubber tubing to a post at shoulder level. Form a loop with the tubing. Position the middle of the tubing over your head and against your forehead. Step forward to remove the slack from the tubing. Assume a staggered stance with your right foot in front of your left. Pull your head forward against the tube’s resistance, feeling the contraction in the front of your neck. Return to starting position. Perform 10 to 12 reps for three sets. Do isometric contractions in which you push your head against your hands to strengthen your neck. Begin by sitting in a chair or on a bench, keeping your back erect and head up. Place both hands on your forehead, palms facing your body, and gently push your head back as far as is comfortable. Resist the movement with your neck muscles. Return to the starting position, continuing to push your head against your hands. Avoid pushing too hard and putting your neck at risk of injury. When performing resistance exercises for the neck, the muscles around your neckline require a warm-up in the same way that you’d warm your body for any weight-training regimen. Do five to 10 minutes of light aerobic activity. Focus on proper form to lower the risk of injury to your neck, which is a delicate part of your body. If your form begins to slip due to fatigue, stop the exercise. If you’re recovering from any spinal injuries or conditions, avoid exercises that put pressure on your vertebrae.